Galeri has established a firm relationship with Oily Cart Theatre Company over the past 6 years. 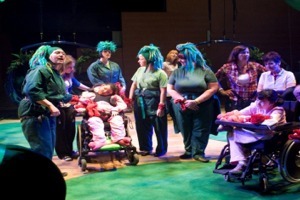 Their most ambitious production to date “Something In The Air”for children on the autistic spectrum held its Welsh exclusive premiere at Galeri in 2010. An intimate show involving original live music, innovative lighting, and interactive video projection, Blue took place within a specially constructed installation, the ‘Blues Shack’. The audience were invited to enter this ‘wonderland’ evoking the sights, sounds and smells of the deep south, and spending some time with Belle, Lightnin’, Champion, Ace, Skip and Big Jack as they awaited the arrival of their train. Something in the Air was a collaboration with the aerial theatre company Ockham's Razor. 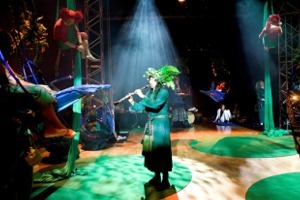 For each show an audience of six young people and six carers were seated in specially created 'nest' chairs and raised into the air to fly in safety and comfort with the Ockham's Razor aerialists. Oily Cart brought a version of Drum to Galeri in 2011 which is suitable for very young children with Profound and Multiple Learning Disabilities or an Autistic Spectrum Disorder. The drums in this show were specially made for Oily Cart by Jamie Linwood. With expertise within Galeri’s staff in this area of work we aim to combine our skills with those of the Oily Cart team, in co-producing, a unique, small - scale Welsh-medium theatre production for children with disabilities in 2012/13, based on secured additional funding. ‘Rhwng Fama and Fancw’ is an original Welsh-language interactive story for 5 – 7 year olds, co-devised by Galeri and the author/storyteller Siwan Llynor. An intimate sensory experience for an audience of up to 10 children. The show was trialled in the Peblig Communities First area in 2011. ‘In The Frame’ was a bilingual film-making experience for a local secondary school and referral unit. Facilitated by filmmaker Eilir Pierce, the young people were introduced to the areas of film literacy, acting for film, lighting for film, sound for film, scriptwriting, directing and editing, gaining practical experience resulting in insight into these different areas. The aims of ‘In the Frame’ were to offer positive learning experiences, fostering a range of transferable skills including concentration, conceptual thinking, communication, commitment and planning along with an introduction into the technical aspects of filmmaking. In July 2009 a group of young people from Ysgol Pendalar, poet Mei Mac, animator Meical Roberts and musician Gronw Roberts came together to create their unique film in response to Caernarfon Castle, culminating in ‘Cylchoedd Rownd y Byd’. The film is part of the Cultural Olympiad project ‘Cauldrons and Furnaces’ and offers a new and inspiring take on Super Furry Animals’ song ‘Rings around the World’. The short animation has won Zoom Best Welsh Language Award and the Zoom Award (Ysbryd yr Wŷl).